Two years ago the NFL adjusted its mark because it felt the previous mark didn't "pop" enough on television. The old mark had become dated with its 25 stars and curly letters and the NFL was right in revising it. The new mark features eight stars (one for each division) and block letters. The block letters are definitely more in tune with the image of a tough, physical sport such as football. 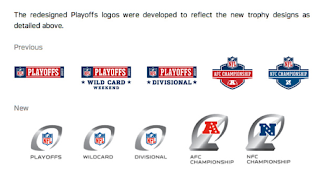 Now it seems that the updating effort has become complete as the NFL recently released new logos for the entire postseason, which include new conference marks as well. The previous conference marks were, in short, slab serif letters (N for NFC and A for AFC) complemented by stars. 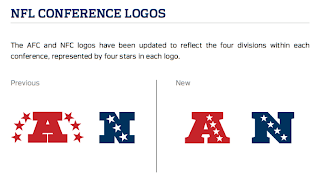 While the NFC logo featured three stars (one for each division), the AFC mark utilized 6 stars (two per division). I never quite understood the rationale behind that inconsistency, and apparently the current brass of the NFL agrees because each of the new marks features four stars. (An aside: The NFL realigned in 2002 with the addition of the Houston Texans, expanding to four divisions in each conference, from three.) I, for one, like the new conference logos, not only because they both now feature the appropriate number of stars, but also because the block serifs have been tastefully reduced, effectively bringing the logos out of the 70s and into the 21st century. The playoffs also received a face lift with the introduction of new playoff logos. The previous set had been in use since 2005. 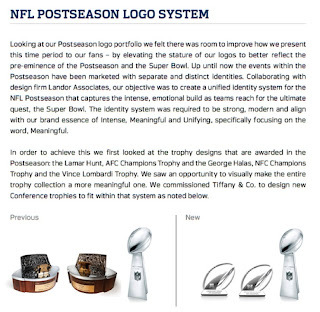 The new logos try to capture a greater sense of motion and are meant to be in tune with the new Lamar Hunt (AFC Champion) and George Halas (NFC Champion) trophies. As a graphic designer, and former graphic design student, I do have one worry regarding the new marks. Every graphic designer is taught to think about where their designs will appear, from which medium, to what venue. The old marks were effective, in part, because they were easy to replicate. They used blocks of solid color and simple, highly legible, type. The new marks use a gradiation of grey for a metallic sheen. The issue is that these marks will be painted on the fields of the host teams throughout the playoffs, and in my entire football-watching life, I have never seen anyone execute a gradient in paint on a football field. It will be interesting to see how the NFL handles this challenge. Do they try to execute the gradient and possibly revolutionize football field design, or do they have alternate marks with the gradient replaced by solid grey or silver? In addition, the old marks used solid shapes to anchor the text on a consistent background, whereas the new marks have a lockup treatment in which the text is not encompassed in the logo, meaning the text is subject to the background color of each individual field. The new marks do accomplish ushering the league into the next decade, but it will be interesting to see how they are executed. The final piece of the re-branding puzzle is the trophies themselves. While the Lombardi Trophy is iconic and doesn't appear to have changed, the Conference Championship trophies have undergone a significant metamorphosis. While the previous trophies featured wood grain and the conference logos against a a backdrop of football players, the new awards look to be all metal and feature abstract designs that convey the motion that the logos do. The Conference Championship trophies are now more cohesive with the Lombardi Trophy, thus unifying the entire set, which the NFL initially set out to do. 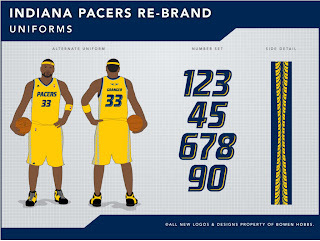 The design portion of this week's post focuses on the Indiana Pacers. The Pacers' current identity utilizes what I like to call the "Fast P". The Fast P features a basketball with motion lines against an italicized P. The name Pacers stems, in part, from the state's rich history of harness and auto racing. With that in mind, I set out to create an identity that embraced that history visually, not just in name. The primary logo features a yellow IRL (Indy Racing League) car against the word PACERS on a navy blue holding shape. The secondary logo is the car without the text lockup treatment. The tertiary logo is inspired by the logo for Indianapolis Motor Speedway, site of the Indianapolis 500 and the Brickyard 400. The wordmarks feature a beveled treatment and italicized letters to give the perception of speed. The uniforms feature the italicized type treatment as well as tire tread striping. 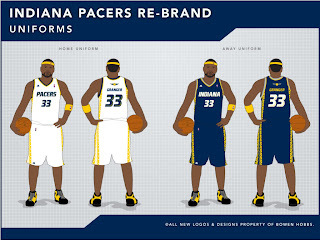 The home uniforms use the PACERS wordmark, while the roads use the INDIANA version. The tertiary logo makes an appearance above the NOB (name on back). The alternate uniform is similar to the home uniform, except that it is yellow with silver side panels and detailing. Feel free to leave a comment on the the NFL's new logos, the Pacers design above, or anything sports design related.